1. 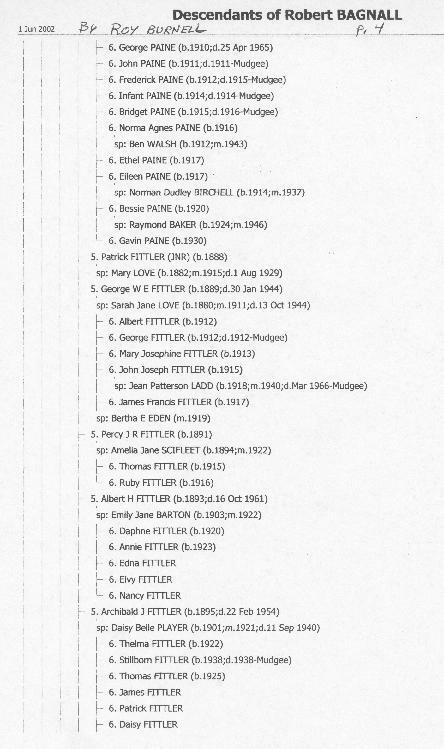 )to deposit genealogical information on the Bagnall\Bagnell families near Tullamore, Ireland in an effort to help establish connections to their descendents. 2. 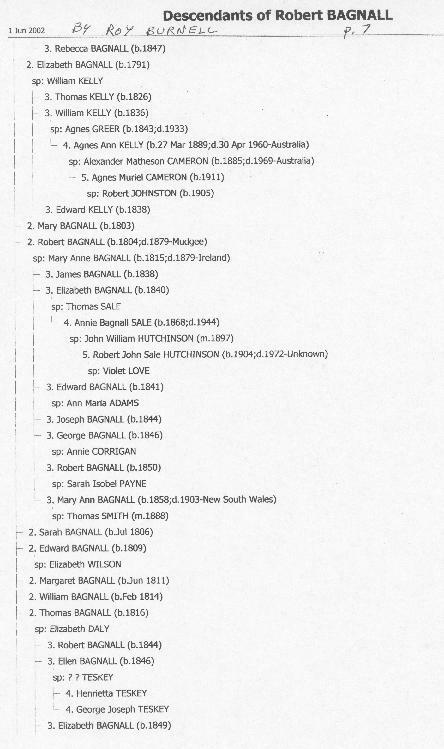 )to make Bagnall genealogical information available to a wider audience. It will be useful only if others contribute and document their information as to where it comes from, etc. At least two other Bagnall web pages are available. b. Stuart Bagnall has a web site on English Bagnalls which can be reached by clicking here. >>>>>Note: Some scans are quite large and require a long time to load. Please wait patiently. A. The book "A Family Tapestry. Book 2, published privately in 1949 contains information about the Tullamore Area Bagnalls. Louise Croyden of Ontario, Canada furnished me with copies of some of the pertinent pages on the Bagnalls. Betty Smith furnished pages 12 thru 18 later. The available pages are noted here. Click to view a page then use your "back" button to return here. You may need 800 resolution monitor to read. -------3. 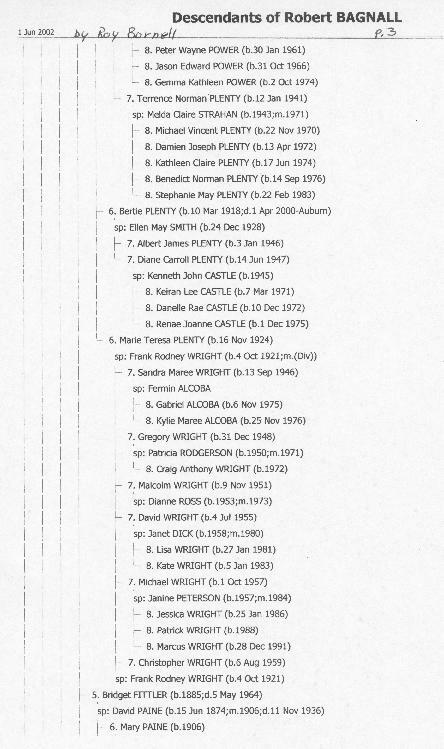 Item from Andy Thomson (unknown original source) "Consolidated List of Burials"
-------3. John Bagnall of Kingstown (Dublin Co.) Died 1836/37 - by Ginny Haen, a descendant. -------4. For Betty Smith's (see p. 25 "A Family Tapestry") connection to the Bagnalls click here. -------1. Letter Daniel Parkinson (click here for corrected e-mail address) to Ginny Haen, 2 Jan 1998 click here for copy of letter. ---------1b. List of Bagnall Marriages (1814-1901) Geashill Parish (near Tullamore)click here. -------3. Rawdon, Canada Bagnalls from Geashill (from Daniel Parkinson) click here. ---------3a. Bagnalls of Hemmingford, QC (from Daniel Parkinson) click here. ---------3b. 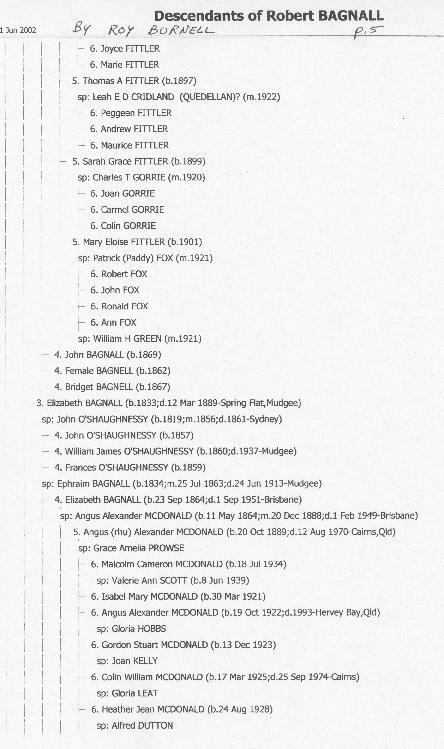 Descendants of Alice Bagnall & Edward Tighe (from Douglas Wilson) click here. -------4. New Brunswick, Canada Bagnells (from Francis 'Butch' Bagnell) click here. -------5. Bagnalls from Rahugh, Ireland to Ontario & USA. (from Joyce Tremblay) click here. ---------5b. For more information on these Bagnalls from Joyce click here. ---------5c. 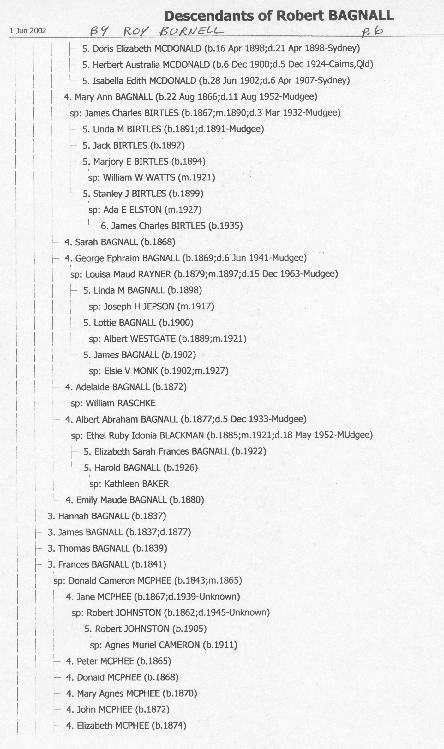 An interesting Bio for Samuel Bagnell and Joyce Tremblay's Bagnall Family Research notes. click here. ---------5d. Children of Samuel Bagnall (1836-1917) & Elizabeth Stephenson (Mariah, Thomas, Henry, John, Emma, Herbert, Charles, George, Minnie) and Alfred Bagnall (1854-1924) & Mary Bessie Gray (Frank, Jean, Joseph, Elizabeth, Marguerite, John). ---------5e. Children of John Bagnall, (1862-1940) & Bridget Jubenville (1881-1954) (Roy & Cifford) and of Herbert Bagnall (Ann) and of Charles James Bagnall (Charles & Horace). -------6. 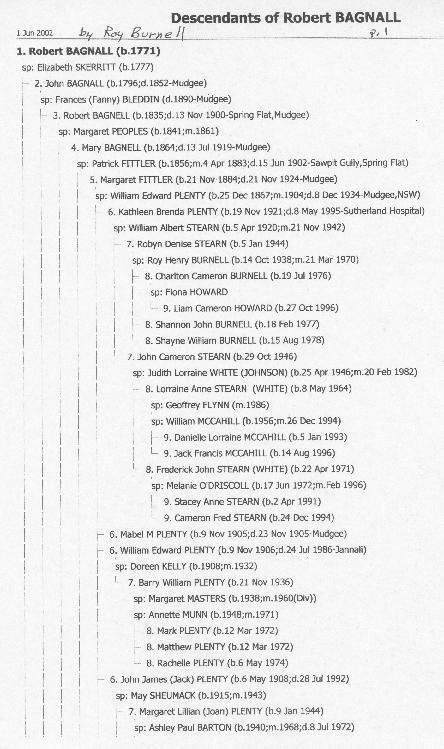 Marcia Bagnell Nelson(click here to mail) has posted a GED of Australian descendants of William Bagnall (b. 1767, Tullamore) on the internet at Ancestry.com To get a copy of the GED, go to Ancestory.com and search for Abraham Bagnall. -------4. Another item from Andy Thomson "Rahugh Land Occupiers in 1854". -------7. Prerogative Marriages in Ireland - Bagnalls 1692-1746 click here, with link to Hennrietta May's "Bagenal Family" web page. (about 60 miles south south east of Tullamore). -------1. 39 Area Photos and Descriptions Contributed by Betty & Robert Smith. -------2. Fieldcrest Manuscript on "Bagenal Family" by Reynolds Fieldcrest, 1990. I. Links to other web sites on Travel in Ireland and Area Histories. -------1.Ireland Travel Specialist (requires internet connection) with lots of online information on towns in Ireland and travel tips. I found 'Bed & Breakfast locations' all over Ireland and usually available near wherever you want to stay. -------2.Local Ireland Information. (requires internet connection) One of the best sources and a good place to start!! -------3.Reading Resources of the Tullamore Historical & Archaeological Soceity,(requires internet connection) a web site with history of the town and nearby areas as well as today's events. Very interesting! -------4. History of Birr and the Castle there.. The Parsons family has occupied Birr Castle since 1620! -------5. Clogheen (or Shanrahan), near Tipperary where Bagnalls lived. (requires internet connection). 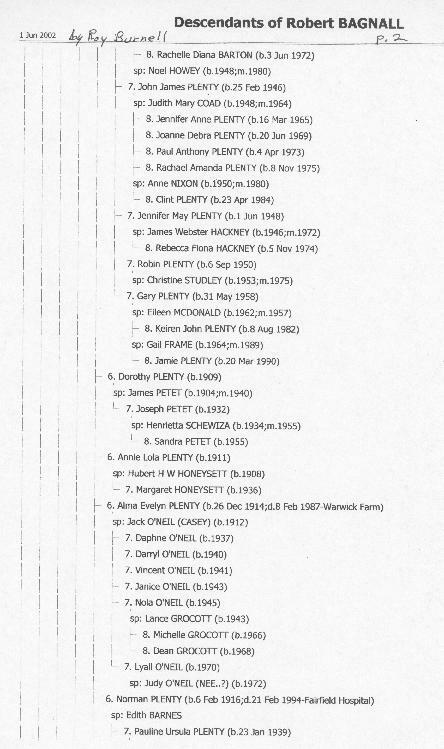 (see p. 19 of 'Family Tapestry', above ) Internet site located by Betty Smith and of interest for early Bagnall links. -------6. See an interesting homepage of J. Condon of Thurles, Ireland with history and photos of the area where Bagwells lived (p. 18 Tapestry) (note from Betty Smith).